Iris Morgenstern has to figure out how to say goodbye. In her decades of teaching high school in El Paso, Texas, Iris has only had a few students who have stayed in her heart and her life for many years after they graduated. She taught a boy named Robert Avila in the late 1980s, and today he is even dearer to Iris than he was when he captured her heart as a witty, energetic teenager with a knack for writing. I met Robert was he was a sophomore in my English class at Bel Air High School. He was crazy enough to sign up for my class when he was a junior and again as a senior. He has a very quick mind and was able to analyze literature without any help often looking at different aspects of readings. His writing is usually humorous. We have kept in touch on and off since then. He was in the Navy and has a 15 year old son. Those are the basics by they don’t tell anyone about his kind gentle nature and his humorous spirit. He was always making comments about having to bend in half whenever he gave me a hug and asked where I could grow just a couple of inches — tall not wide with a twinkle & laugh in his eyes. Iris and Robert on January 2, 2012, visiting through the glass. I have seen Robert help kittens who were only days old. His huge hands held the tiny creatures while he fed them with a dropper or bottle. There was one I truly believed he willed to live. These are the things Iris wanted me to know about Robert as she tried to figure out what to say to him in their last visit. 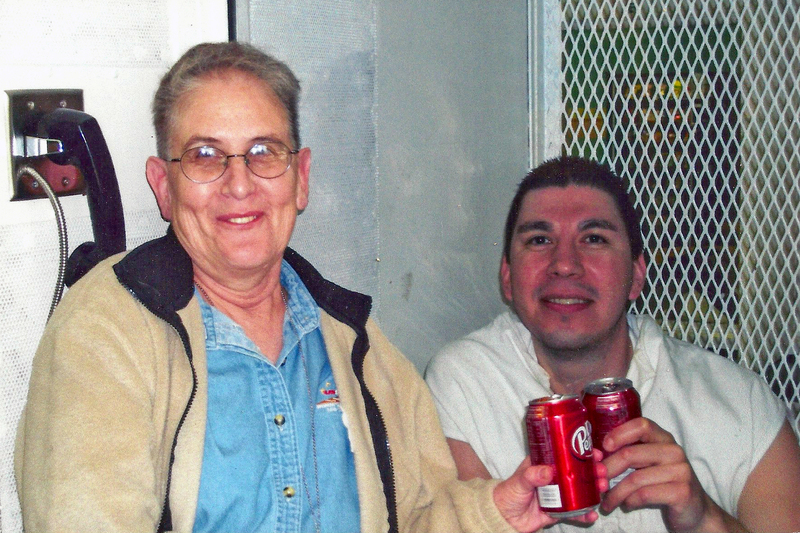 Robert now lives on death row, and on the day after his birthday–a few weeks ago–he was given an execution date: December 12, 2012. Iris, Robert’s family, and some Catholic death penalty activists in El Paso lobbied to have Robert’s execution date changed because December 12 is also the feast day for Our Lady of Guadalupe. The state of Texas acquiesced and changed the date of the execution, but for a few agonizing days we did not know if his date would be postponed or moved earlier. This morning Iris wrote to let me know that Robert’s new execution date is April 10, 2013. The faithful among us might say the Virgen gave him one more Christmas and four more months to live. Iris is on her way to visit Robert this week, and before she found out about the new execution date, she believed this would be the last time she saw Robert alive. Before he had the chance to invite her to witness his execution, Iris told Robert that she cannot watch the state kill someone she loves. It would break her. Instead, she planned this trip but does not know how to say goodbye. Now perhaps she will have the chance to see him again before April, but her dilemma has not been solved. The state of Texas still plans to take the life of a person Iris helped to nurture into adulthood, and these months of reprieve will prove all too short. I didn’t know how to advise Iris when she called me asking for advice about how to say goodbye to Robert, but I was able to tell her about a young man named Matthew Puckett who was killed by the state of Mississippi on March 20, 2012. I never knew Matt Puckett, but we had a mutual friend in common–a man named Matt Erickson who asked a whole lot of people to write letters to Matt Puckett in his last days. I wrote to Matt Puckett shortly before his execution, and after his death, Matt Erickson told me that Matt Puckett had said that my letter and the others he received comforted him in the days leading up to his execution. Matt Puckett’s mother received those letters after her son’s death and also relayed her gratitude for them to Matt Erickson. I proposed to Iris that we do the same thing for Robert in these months that remain to him. If you are reading this blog, chances are that you oppose the death penalty. I have no idea what crime Robert Avila was accused of committing, and it’s not my job to try or judge him. What I do know is that I don’t want him or anyone else to die in the name of justice. The death penalty compounds one tragedy with another, and as a Texan, I do not want Robert to die in my name. What I know is what a great person Iris Morgenstern is and that she truly loves Robert. I stand with Iris, with Robert’s family, and with the many families, like my own, whose loved ones are kept from us by concrete, razor wire, and a legal system that values vengeance more than either compassion or public safety. Keep Robert and Iris in your thoughts. When we see people for their full humanity, it ought to be harder for us to condone their deaths. Out of context, Robert might just look like a death row prisoner, but more than that, he will always be one of the students Iris Morgenstern loves best. I sincerely apologize for not yet finding a moment to write about the incredible experiences I had performing Doin’ Time last month at Illinois State University and at Lincoln Correctional Center, but I promise to provide an update soon. In the mean time, here is a link to a radio interview I did with the local NPR station in Bloomington just prior to my performances there. Please note that at the end of the radio interview I stated the wrong name of the activist organization I was describing. The organization I’m actually describing at this moment in the interview is Our Children’s Place, which is an amazing group of folks in North Carolina who provide support for the children of prisoners. The organization I named instead is another great activist organization called All of Us or None, which serves prisoners and reentrants nationwide. Both groups are doing vital and difficult work, and I am proud to support their efforts.